A former student of mine, Jonathan Jones (@JJ_159) has kindly set up a new combined general election forecast page and blog at ElectionsEtc.com with a twitter account @ElectionsEtc. Please follow those links for future updates and discussion of the forecast. I’m very grateful to Jonathan who suggested the new site, set it up and is managing it all for free in his spare time. I think it is great. I hope you like it. Although Jonathan is a Lib Dem, the forecast and commentary will remain a non-partisan data-driven statistical exercise. There is no change in the methodology associated with the site move. This page will stay up for the record, but will no longer be updated. 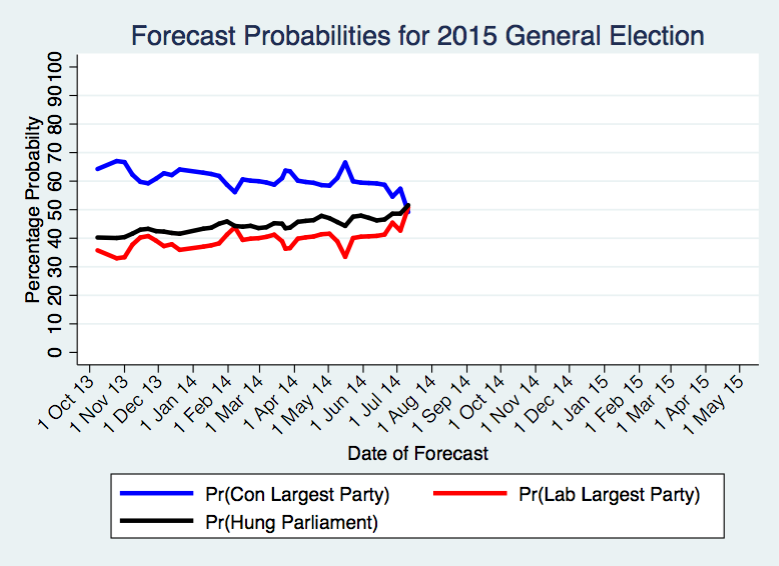 This page gives details of the current forecast from a new polls-based method for forecasting a general election on 7th May 2015. The method was revised in February 2014 and is described in a working paper. The original October 2013 working paper is here. There is also occasional commentary at my Elections etc. blog. To receive Tweets with updates of both the forecast and commentary, follow me @StephenDFisher. The approach is broadly to predict the next election based on current opinion polls and the track record of polls in previous electoral cycles, allowing for change in opinion in the run up to the election. The method allows for three main historical tendencies: governments being more likely to recover and oppositions fall back; parties moving back towards their long-run average level of support and/or the level of support at the previous election; and lastly and by far the least important tendency is for the Conservatives to over perform and Labour to under perform their vote intention figures in the polls when it comes to election day. All three suggest a Conservative recovery and a Labour set back from autumn 2013. The statistical regression methodology generates estimates of uncertainty and so prediction intervals (range of likely outcomes) and probabilities for key events are also provided below. The forecast represents a way to think about the implications of current opinion polls for the outcome of the next general election in light of the historical relationship between polls and election results. It is the product of a statistical analysis of the data and not my personal opinion about what will happen. 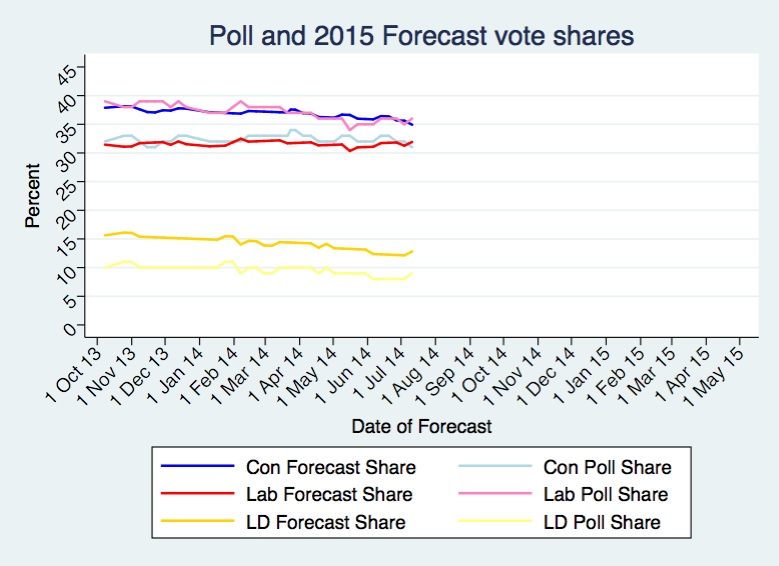 Assuming LD share at 12.8 and Other share at 20.4 and allowing Con and Lab to vary as per intervals above. The inputted current polling average is that from UK Polling Report, chosen because it is sensible, convenient and frequently updated. But this is not a claim that this is necessarily the best estimate of current opinion and it would be reasonable to use other methods of averaging recent polls. On occasion I will adjust the polling average to make it more up to date. I try to update the forecast every week, and mostly on Fridays. Acknowledgements: I am very grateful for comments to John Curtice, Jouni Kuha, Clive Payne, Mark Pickup and Chris Prosser, and to Rob Ford, Will Jennings and Chris Wlezien for early discussions about this work. I am also very grateful for the numerous and wide ranging comments on Twitter and elsewhere online in response to previous drafts. The paper has been revised substantially in part thanks to them. Most especially, I am indebted to Will Jennings for compiling and preparing the historical polling data. The methodology is a combination of previously developed techniques with refinements and new developments. Please see the working paper for full details including citations to previous related methods.